Be the first to share your favorite memory, photo or story of Margie. This memorial page is dedicated for family, friends and future generations to celebrate the life of their loved one. Margie Lee Trammell passed away peacefully at Meadow Lake Nursing in Tyler on January 29, 2019. She was born on September 3, 1923 to Thomas Franklin Roby and Nina D. Hood Roby. She was preceded in death by her parents; her sisters, Iryne Munster, and Mildred Socia; her brothers, Howard Roby, Benny Jack Roby and Billy Hugh Roby. 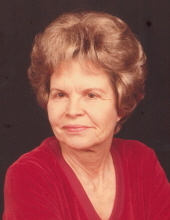 Margie lived a large portion of her life in Garland, Texas. She worked for many years for the Texas Department of Human Resources in Athens and later in Garland where she retired. Margie loved going to Senior citizens events and loved to ballroom dance. She was a very strong-willed person who was climbing up on her house to rake off leaves at age 80. Margie loved going to thrift stores and buying clothes that she would take home, take them apart seam by seam and then sew them back together. This was a fun hobby that she enjoyed. Margie was known to have a very funny sense of humor and was a lot of fun to be around. She will be greatly missed by all of those who knew her and loved her. She is survived by her siblings; sister, Jo Ann Bedsole; brother, Jimmy Roby; her nieces, Callie Nisbet, Sue Hilton, Carrie Strieff, along with numerous other nieces and nephews. Graveside services will be held on Sunday, February 3, 2019 at 2:00 PM at Oaklawn Memorial Park in Athens. Arrangements by Autry’s Carroll-Lehr Funeral Home. "Email Address" would like to share the life celebration of Margie Lee Trammell. Click on the "link" to go to share a favorite memory or leave a condolence message for the family.